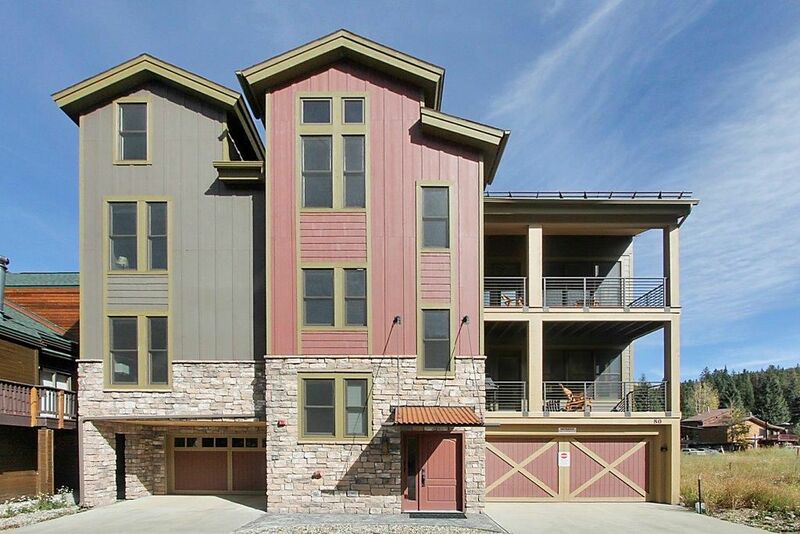 This unique forward-thinking urban style townhome is located 1/3 mile away from Winter Park Ski Resort in Old Town. Inside the quiet location of a two residence building, it has three bedrooms centered around an open floor plan promoting social gatherings for days. Inside features an on open kitchen, bar seating and beautiful dining table. A plush lounge is situated around a gas fireplace and flat screen TV while the attached private deck provides a gas grill and great slope views. Down below is an oversized one car garage, mud-room, and ski storage area. Choose to take the elevator or stairs to access the main and upper levels. Additionally, this townhome is ADA compliant with wider doorways, a no-threshold shower, and wide sink design making this a very convenient property for anybody with mobility issues. Group Lodging Option: Larger groups may book Old Town Loft 1 & Old Town Loft 2 together to sleep up to 22 people. Sleeping Arrangements: A king in the Master, Queen in the second bedroom, a twin with twin trundle bed in the third bedroom and a queen pullout in the living area. Sleeps up to 8. Location: Old Town Winter Park; 1/3 mile from Winter Park Resort ski area and two miles from downtown Winter Park. 100 yards from free Winter shuttle route. Winter Park Lodging Company provides custom, stress-free experiences for every type of traveler, offering high-end vacation homes, exceptional customer service, and sharing our passion for mountain living. The Winter Park Lodging Company Difference 24/7 Local Help: Book with confidence knowing that the rates, images and details published on this property are 100% accurate. We are conveniently headquartered in Winter Park, this provides us with a local advantage to take care of any issue or need that may arise during your stay, 24/7. If any questions, needs or concerns arise just call us and we will be there at your door to make it right. Keyless Lock: This home is equipped with a Smart Lock, allowing easy, secure access to your property at check-in and throughout your stay. There's no need to check in at a separate location! What's Included: Every home is stocked with all your household essentials, high quality sheets and towels, and a starter kit of Aveda bathroom products, and an ample supply of laundry detergent, trash bags, dish soap, tissues, etc. We're Following the Rules: This vacation rental is professionally managed and follows all local & state tax rules. Your reservation total includes all applicable taxes, cleaning fee, and Accidental Property Damage Protection. Master Bath shower with no threshold entry, a steam shower. Second Bath has a tub shower and a double sink. Private water closet. Elevator to Unit. Wheel Chair Access. Roll up sink and no threshold steam shower in Master. We enjoyed our stay at Old Town Loft 1. It had everything we needed to feel at home. The location was terrific. You could walk to the resort, but not in ski gear! The condo was very nice inside. Winter Park lodging was very helpful and attentive. We would definitely stay here again! Huge, well appointed space and easy access to the shuttle to the mountain. Thank you David. Please give us a call if we can host you again. Thr condo wa Avery large. The kitchen is we stocked with everything you could need to cook nand we really took advantage of that. The large island had seating available and there was a nice dining table as well. The master suite was really awesome and the other two bedrooms and shared bathroom were also really nice. The washer dryer was very handy. The property was very conveniently located, only a few steps from the shuttle. Having a covered garage with a warm mudroom for all of your equipment was also a nice bonus. All in all, we had a great stay and highly recommend this property for your stay at Winter Party. Thanks Robert! We are so pleased you enjoyed staying with us at Old Town Loft #1. It is so fun when you can be so close to the Resort yet have a nice quiet spot to head home to. Please reach out to us when you're back this way. Our family stayed here over the New Year’s holiday and it was a wonderful place! It was nice being in a location with radiant heat in the winter, no cold feet walking around. The kitchen had wonderful amenities and everything we needed to cook our meals. The mudroom downstairs was also handy for keeping our ski gear warm overnight and giving us a place to change as we came and went each day. We will definitely look at staying here again in the future! Excellent! Yes, the Old Town Lofts are terrific for location and amenities. Do let us know when your next trip starts getting planned. Thanks Robert. Well put! We are all so pleased you enjoyed your time up here with us. Do contact us when you come back to enjoy the mountains! Spacious - New - Close to everything. World Class Skiing at Winter Park and Mary Jane resort. Miles of well marked Mountain Bike trails; Mtn bike racing series.